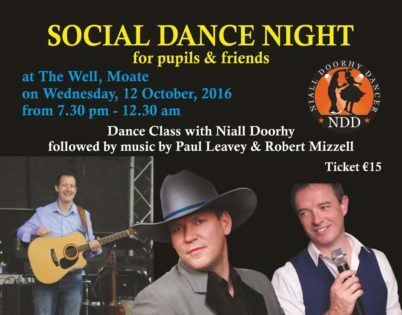 If you are looking for a Social Dance Class together with a great night of music, song and dance along with one of the best Bands in the Irish Country Music Scene, then The Well in Moate is the place to be this Wednesday night the 12th of October. Here I will be hosting my annual Social Dance Night for all my Dancing Friends from all my Classes around the Country. This year is a special one for me as I’m also celebrating my second chance at life following major surgery in April of this year. I can’t think of a better way to celebrate this important milestone in my life than to be with all my Dancing Friends and Buddies together in the one place on the one night. We will be kicking off at 7:30pm when I’ll be holding my normal Social Dance Class. During this class I’ll be teaching Jive, Waltz, Quickstep, Foxtrot and some Line Dances to get you all in the mood for the remainder of the night. Paul Leavy, the man who wrote the classic recession song “Celtic Working Man” will be banging out some great dancing tunes at 9:30pm. Paul Leavy also played support to Nathan Carter at the Moynalty Steam Threshing Festival this year, so he is no stranger to the big stage. At 10:30pm it’s big band time when Robert Mizzell and the Country Kings take to the stage for 2 hours of non-stop, toe-tapping, music, song and dance. The lucky winner will be announced at 11:00am on Wednesday the 12th of October. Good luck to everybody and remember Folks, home was never this good on a Wednesday night. I’d love to know how to dance properly as u said when people go to weddings it’s sooo nice to b able to get up there and dance the night away but don’t don’t no the steps. I’m in co. Wexford and wondering Wud u b doing classes near me I cud go to???? The class is €10 pay as you go. The classes are generally attended by adults but if the two girls are accompanied by a parent and they dance together, I don’t see any problem why that can’t go to the beginners class.